Technological innovation is the first productive force. The vitality and development of enterprises are decided by science and technology.Since the establishment, GANOHERB has been considering scientific and technological innovation as the priority for all.Over the years, the group introduced the international advanced management mechanism, and has the top-ranking ganoderma R&D center in Asia. Several internationally and nationally renowned specialists are retained as technical consultants for the company. As a result, GANOHERB has become a proactive corporation backed by scientific experts with advanced degrees and technological support. ◎ GANOHERB was assigned as one of the National R&D Centers for Edible-Fungi Processing by the Ministry of Agriculture in 2007. ◎ In 2012, GANOHERB was authorized as the [Local-State United Engineering Research Center for the Plantation and Futher-processing of Medicinal Fungi"
◎ In 2007, GANOHERB was appointed to establish the national standard in Technology Standards in Collection and Processing of Ganoderma Spore Powder. And in 2012, the national standard has been passed through the relevant examination and issued. ◎In 2010, with Fujian FDA, GANOHERB reassumed the composition of the national standards in Technology Standards in Health Food Raw Material Ganoderma Extract, in which the standards of ganoderma`s water extract, alcohol extracts and spore oil are included. ◎ In December 2010, GANOHERB and Institute of Drug Development Chinese Academy of Medical Science found the [GANOHERB Academician Workstation". The academician workstation of GANOHERB was entitled [Top Ten Academician Workstation in Fujian" in December 2011. 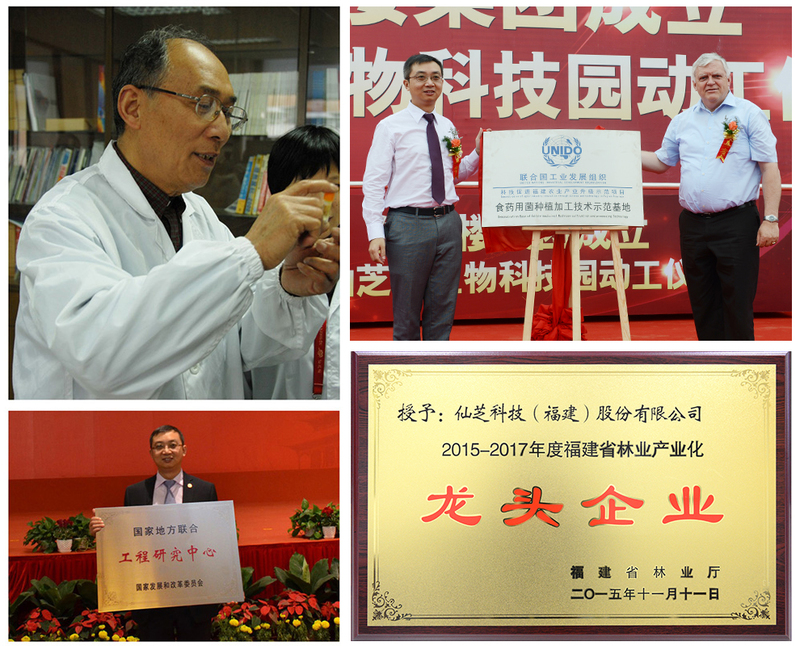 ◎In 2014, GANOHERB Technology(Fujian) Corporation co-founded the " GANOHERB Academician Workstation" with the Institute of Drug Development Chinese Academy of Medical Sciences.It will do bring GANOHERB some internationally new and advanced scientific theories, technologies and processing techniques. ◎ GANOHERB's self-developed technologies in the ganoderma cultivation, the extraction of ganoderma spore powder and coix seed oil, the product formulation and anti-oxidations, Decoction processing technology of improving Ganoderma lucidum polysaccharide dissolution rate as well as the ganoderma spore oil anti-cancer component extraction technology are under a patent protection for 20 years.